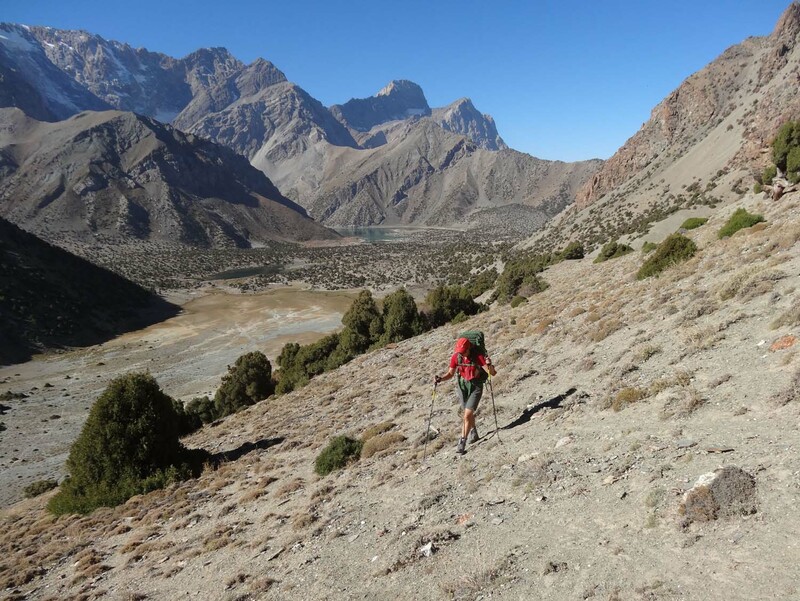 The plan was to go hiking in the beautiful Fan Mountains and there are numerous options to go trekking here, from a day-hike to several weeks. Two of those had our interest: the 7 lakes and the Kulikalon Lakes, but when studying both options a bit more in detail we realised the hike along the 7 lakes follows a road all the way to the top. 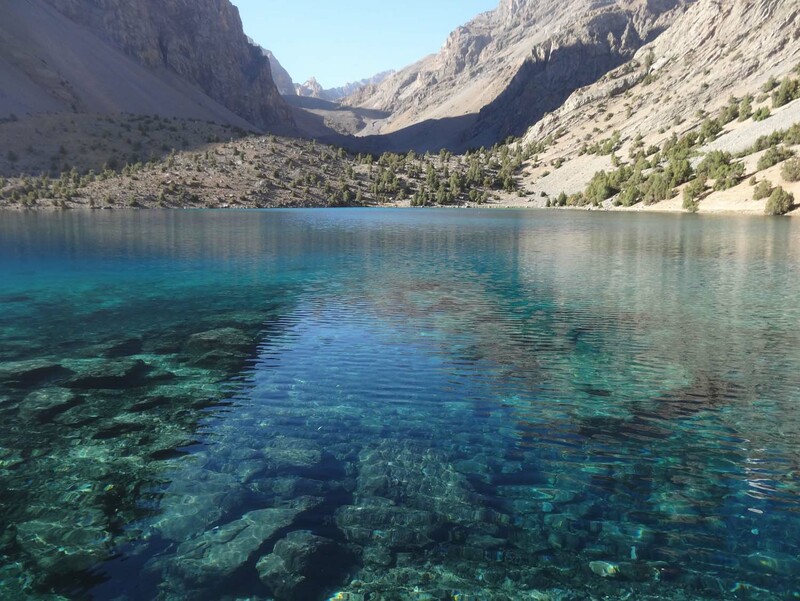 So, we decided to drive to the 7 lakes and walk to the Kulikalon lakes where there are no roads at all. The owner was called and Jon was handed the phone: “Stay where you are, I am coming” was the answer in English from Rashid. 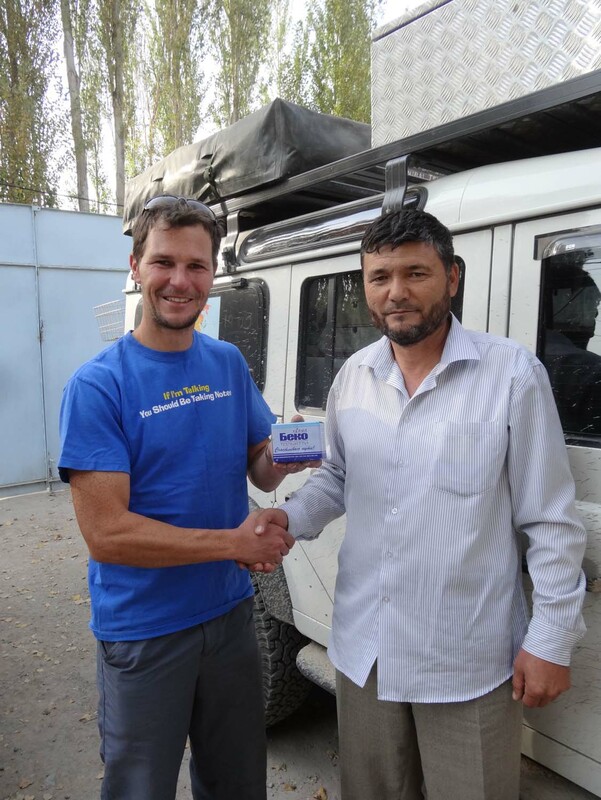 How amazing that the only other Defender owner in Tajikistan speaks English! Over tea, we talked Land Rovers, and he promised to look into it for us. And he did. 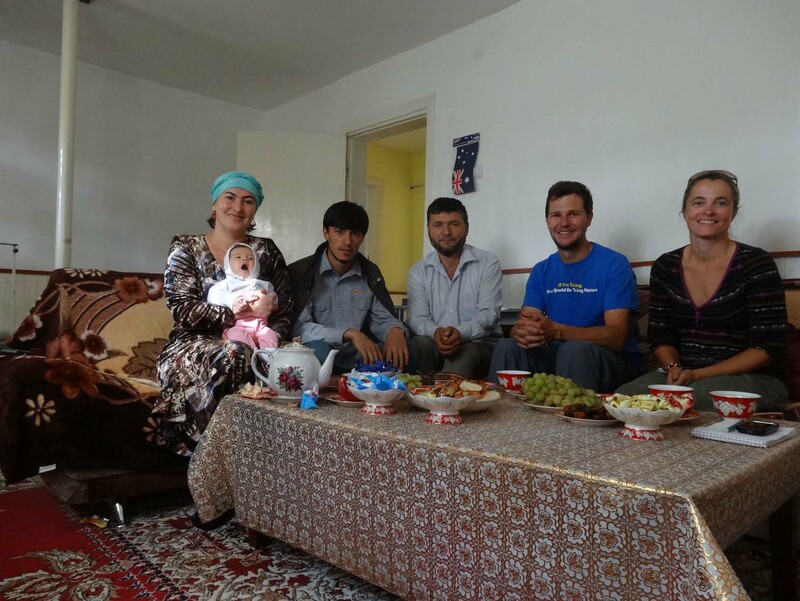 Before heading for the Uzbekistan border after our hike, we drove to Rashid’s house and spent an enjoyable day chatting with Rashid, his lovely wife Munavara and meeting some of their five daughters over a huge lunch. Rashid had very kindly organised for his local workshop to modify some locally available brake pads to fit, as he has done for his own car. Of course, he refused any payment and we left a few hours later enormously humbled by central Asian hospitality yet again. And Lara is now the proud owner of Lada rear brake pads! Jon and Rashid and the Lada brakes for Lara! 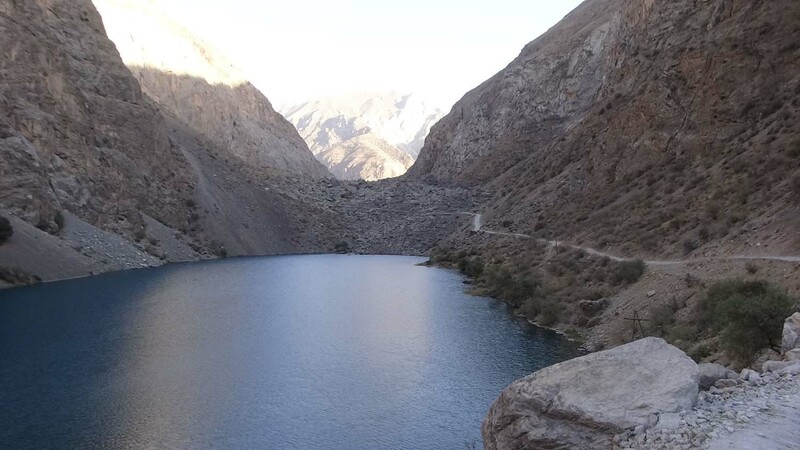 We then drove on up the valley past the 7 lakes, each one higher and more beautiful than the last and all with crystal clear water. Nestled amongst the lakes were well-kept villages, with locals finishing the harvest, who would stop to give us a cheery wave as we passed. 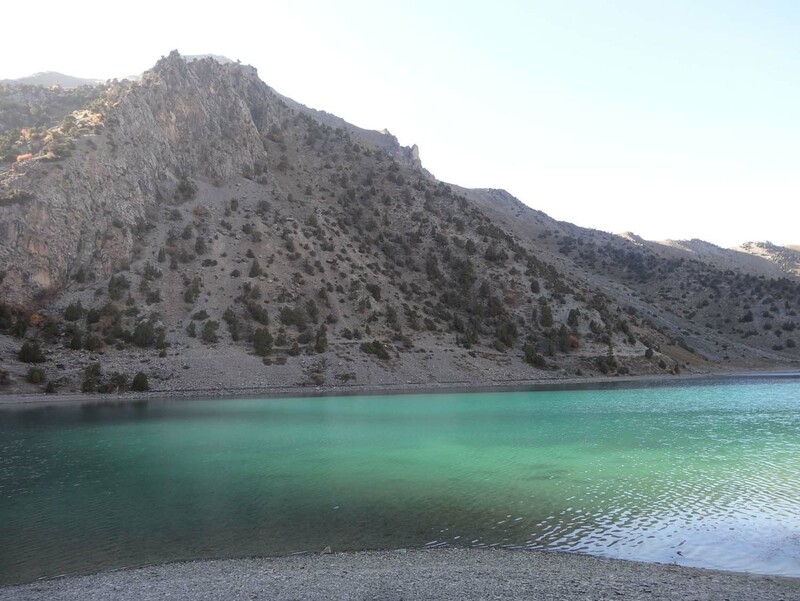 After about 60km and countless hairpin bends we arrived at the seventh lake, our campsite for the night, unfortunately a bit cold for a swim. 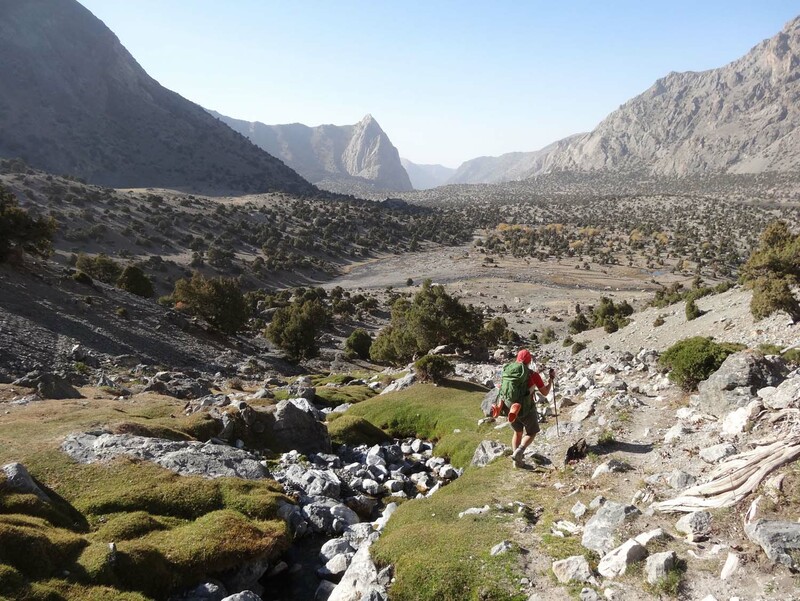 The next day we headed back down and turned back up the Artush Valley to start our trek. We found a campsite for the car near the start of the hike and packed our bags. The next morning Jon was not feeling very well (stomach upset), but we headed out anyway, as you do. 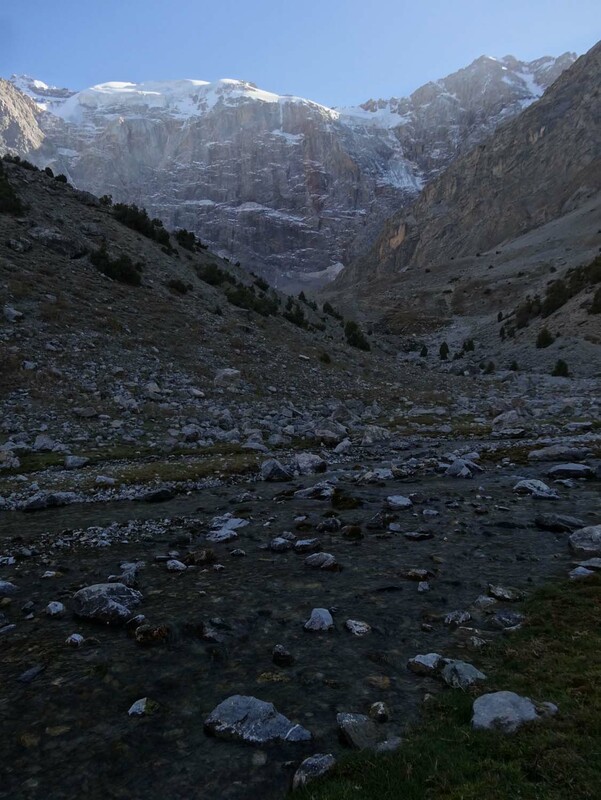 We left our car securely parked in the Artush alpinist camp and started our hike up. 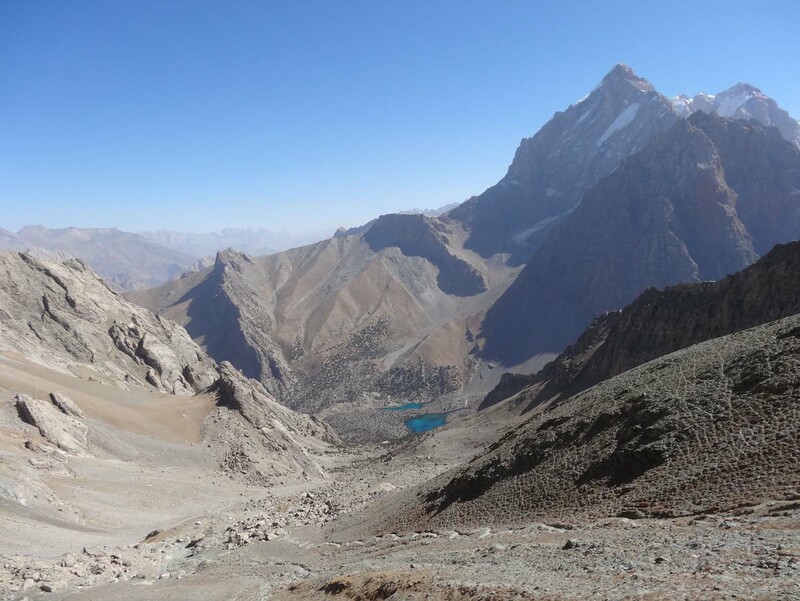 We first headed over the very steep and difficult 3260m Zurmech Pass to the Kulikalon lakes and wanted to come back via the easier route through the valley. It seems nobody takes this difficult route, so there was no trail to follow, making it very difficult going in places. We followed little sections of goats’ trails where we could and on the way down even dropped into the rocky creek bed as it was easier than the steep slopes. Luckily we had found some water on the way down as we were running on empty after all the hard work going up. 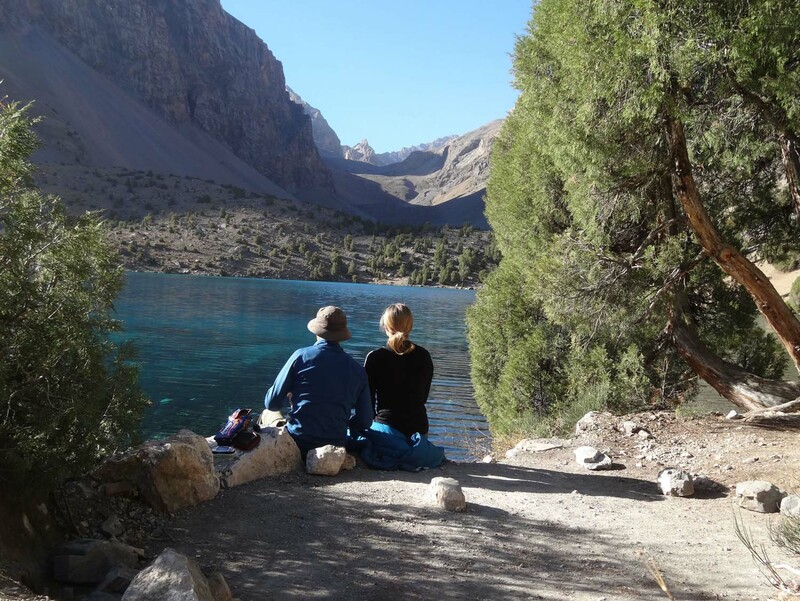 We arrived exhausted at the beautiful Kulikalon lakes. Camp was made at the edge of the lake and we had to endure a ridiculously spicy pasta sauce that night. The downside of not being able to read the labels when buying jars and tins… The days were still warm and sunny, but as soon as the sun disappeared behind the mountains it dropped to freezing (literally) and we didn’t admire the stars for very long. view from our first campsite – do you like it? The next day our route took us over a 3850m pass. 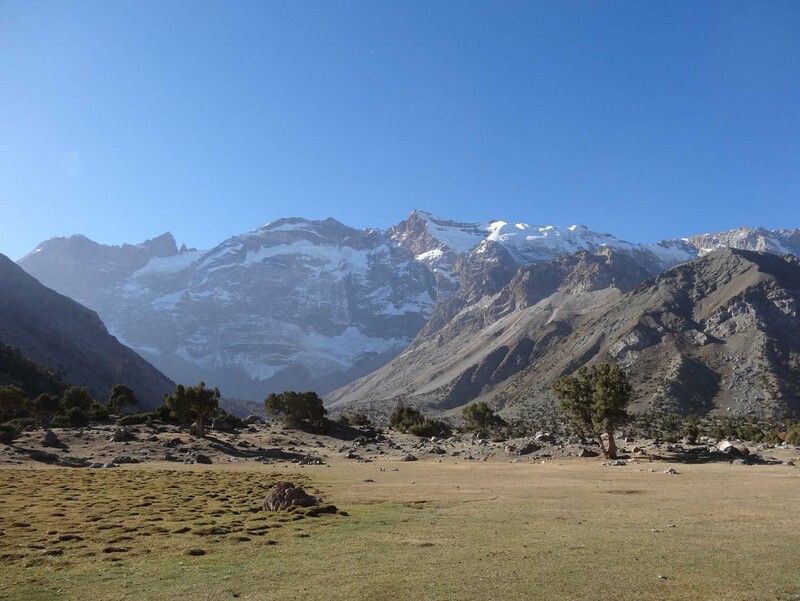 Having camped at 2800m it meant another steep hill up, but at least part of it had a trail from previous hikers and goats. We’d seen the trail from the top of yesterday’s pass and knew exactly where to go. So, with the arrogance of people who know it all, we set off to the start of the trail and started climbing. Parts of the slope had no trail and it was tough going until we reached the well-defined last section. Whilst the trail made it easier, it was still a pretty steep slog up the switchbacks. Elated we reached the top with high-fives and stopped for lunch, enjoying the views back down to the lake and of the 5490m Chimtarga Peak, with fresh snow on top. The way down looked less steep, but that proved deceptive. It took us hours to get down before we could start on the slightly gentler slope through the valley. At the end of the valley we would find the Alauddin Lakes to mark where we would ‘turn left’. The next day we had to hike all the way back to the car, so we wanted to continue a bit past the lakes, to make the final day a bit shorter. Luckily for us, we had walked our intended return leg, planned for the last day. So we could now continue to complete the loop the other way around. 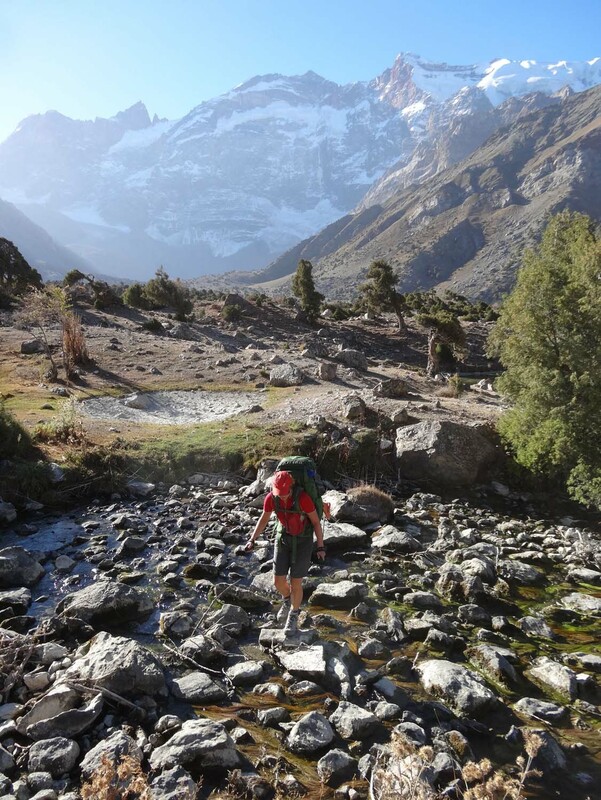 Knowing where we really were and realising we had already made next day’s hike shorter by covering the entire valley after the wrong pass, made us feel a little better and we decided to camp right next to the beautiful stream coming down from the Alauddin lakes. Then Jude’s tummy decided to play up, and in the middle of the night she was up, pouring the contents of her stomach into a bush. After a restless night sleep we decided to try to get back to the car regardless, as we were in a remote spot and it would take Jon at least 2 days to reach her by car. But then luck was on our side. As we were finishing packing up camp, a car drove past and stopped. Which way we were headed was the question and when we pointed towards the Alauddin Lakes he told us to hop in. 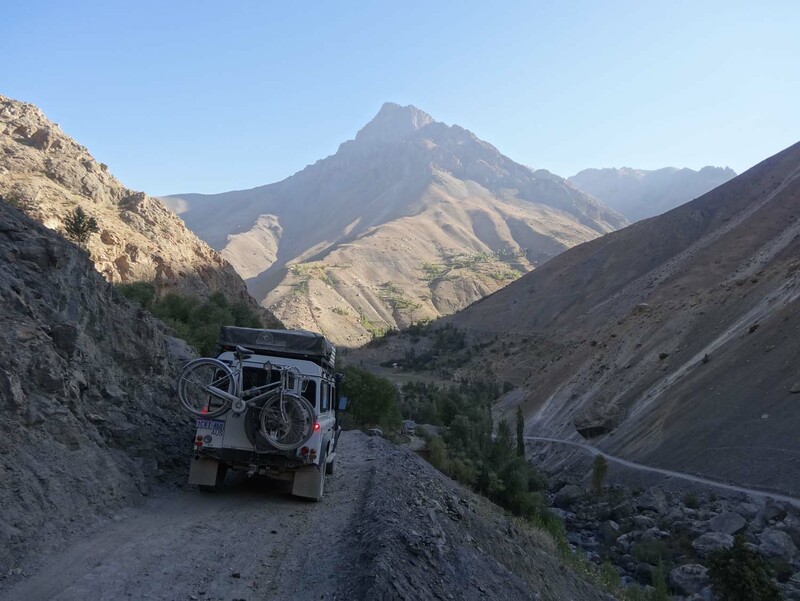 When we got to the camp a few kilometers up the valley, he parked and then walked ahead, showing us the way through the maze of forest trails to the spectacular Alauddin Lakes. He had just saved us 2 precious hours. 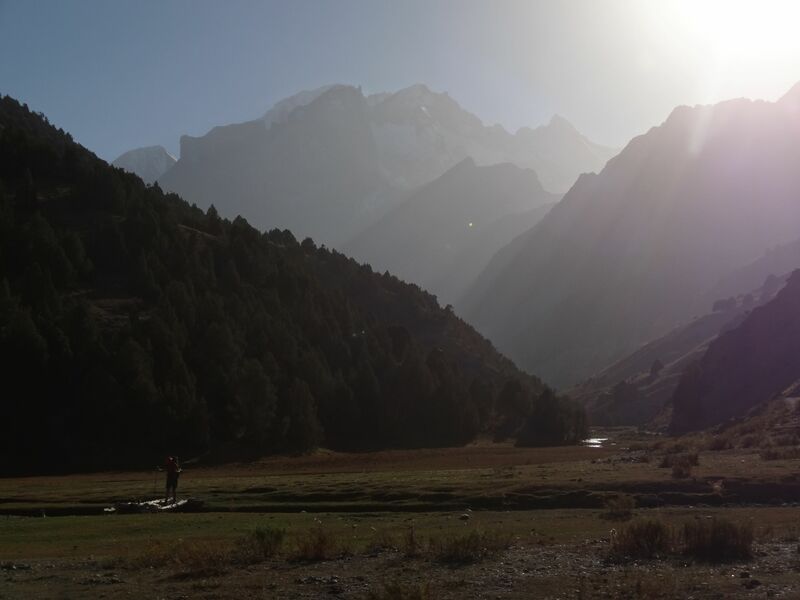 After a stop for morning tea at the lakes we started our ascent to the 3850m Alauddin pass, towering over 1000m above us. Again it was really steep, with lots of lose scree and sand through the many switchbacks and the slog up took us 3 hours. But we made it to the top in time for lunch. We were looking out for a snow leopard near the top as we had just seen many of its footprints, but that’s all we were to see. view from Alauddin pass back to the Alauddin lakes, check out the switchbacks! Going down was a lot easier as it was less steep and with a good trail this time we were making great times. In no time we made it back down to the Kulikalon lakes, more than 1000m below. The scenery was changing constantly and in the valley we were now back amongst sensational trees with twisted, gnarled trunks and branches making them appear thousands of years old (which maybe they were!). We then realized we still had to descent yet another 600m after crossing the plateau with the Kulikalon lakes. After this flat-ish area the going got tougher again. With our legs and knees having turned to jelly many hours ago, we wobbled down the steep track of the last valley between us and our car. Heavily laden donkeys cruised effortlessly past and we were cursing the many lose and uneven sized rocks everywhere on the path making it impossible to get into a rhythm. Of course we did get there in the end, even though it felt like every meter took an hour. As dusk fell, we finally reached Lara, exhausted but very happy we did it. Jude was still feeling crook, so we pitched the tent and she went to bed. 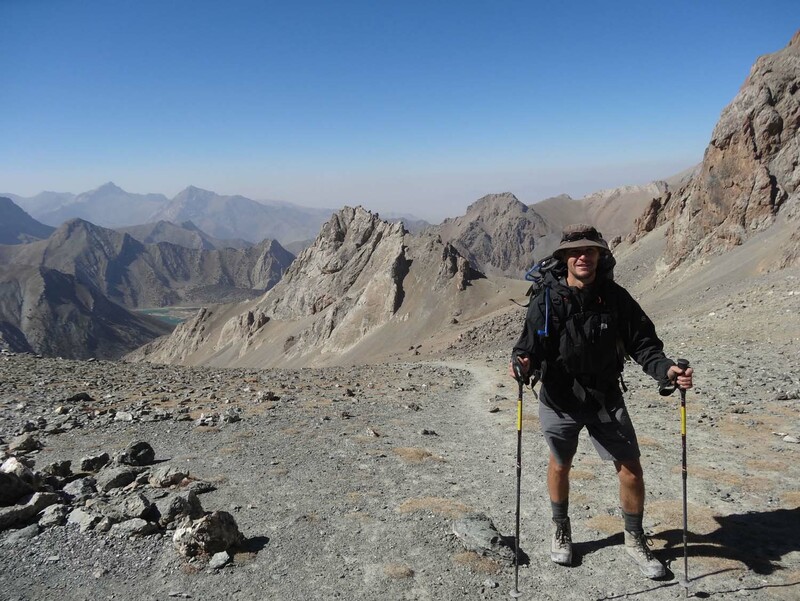 Jon joined a group of French and Dutch tourists in the alpinist camp for a hot shower, beer and some food. Maybe it had been a bit ambitious to cover this loop in 3 days, maybe we were just a little unlucky with both of us suffering from stomach upsets during the hike at different times. But we loved it. Highlight definitely being the spectacular Alauddin Lakes. And our low? 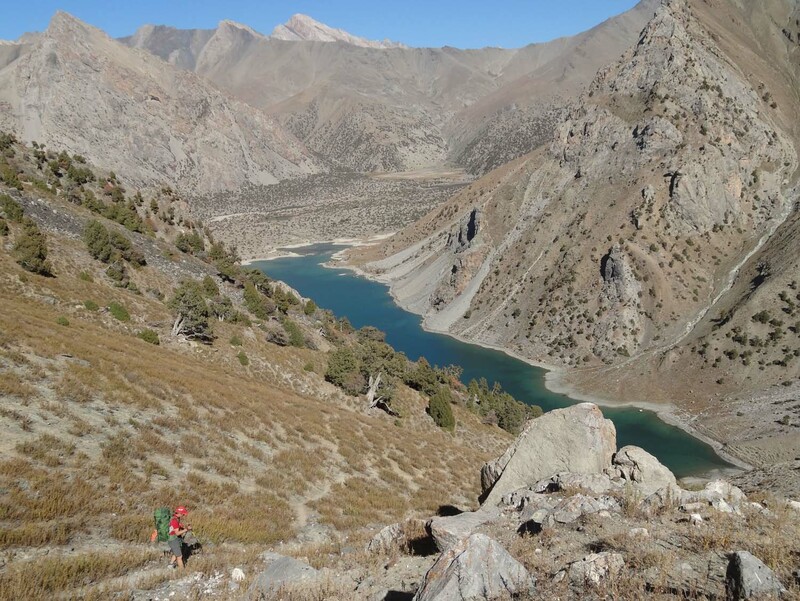 I think you probably guessed it already; not finding the Alauddin Lakes at the bottom of the valley where they were supposed to be (according to 2 arrogant hikers who hadn’t bothered looking at the map properly…). Heel erg (in)spannend!!! Prachtige beelden!! 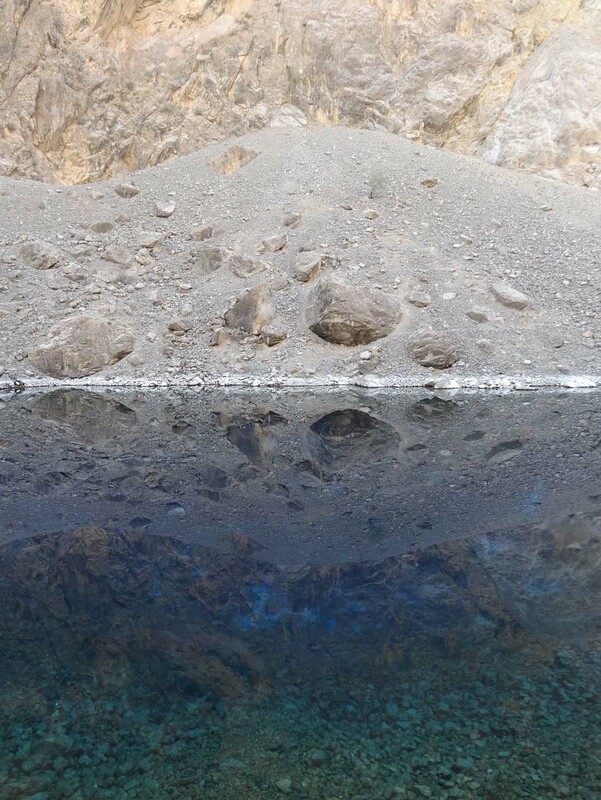 Fantastic photos, these lakes look awesome! Hope you two have recovered from your tummy bug!